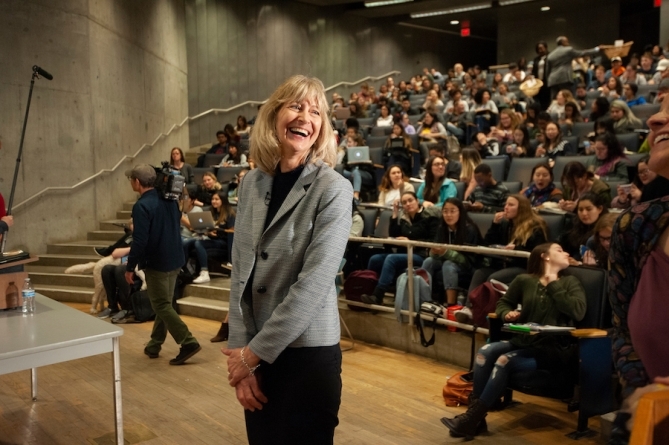 Dr. Anita Oberbauer, an animal science professor at UC Davis, recently received the UC Davis Prize for Undergraduate Teaching and Scholarly Achievement. Oberbauer joined the UC Davis faculty in 1989 and is especially commended for her research on companion and captive animals such as dogs, cats, fish, reptiles and birds. On the afternoon of Mar. 4, Chancellor May and several other administrators delivered the prize to Oberbauer while she was teaching a class in Introductory Companion Animal Biology. The prize amount is $50,000, thanks to the philanthropic efforts at UC Davis. Oberbauer graduated from UC Davis with a Bachelor of Science in Zoology in 1980, a degree which she obtained with highest honors. She later pursued a Ph.D. in Animal Science from Cornell University. She completed postdoctoral fellowships at Loma Linda University and UCLA before joining the UC Davis faculty. According to Chancellor May, glowing student evaluations played a role in selecting Oberbauer. Oberbauer reflected on all of the people who helped her receive this award. To receive this award, someone had to nominate Oberbauer. That person was Helene Dillard, the Dean of the College of Agricultural and Environmental Sciences. May commented on the specific qualities that Oberbauer brings to UC Davis that made her deserving of this honor.